Despite its bright colors and tendency to hover in the same position as it feeds, the hummingbird remains the most difficult animal to hit with an air rifle; on the other hand, the hummingbird is the second easiest animal to dispatch with a fly swatter…the first being the fly. You might find the idea of running after and flailing away at a hummingbird to be ludicrous; however, those of us who do will keep our nectar where it belongs: In our flowers, specifically at the base of the perianth. There are around three hundred and thirty species of hummingbird. All of these species range within North or South America. 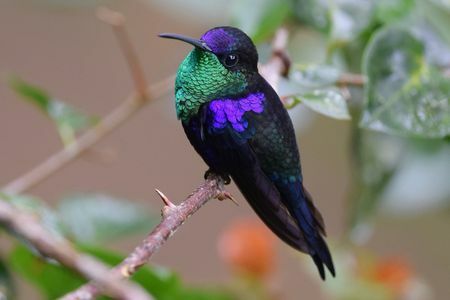 Over half of hummingbird species live in either Ecuador or Brazil. As anyone from Brazil or Ecuador will attest, there is no good reason for this. Zoologists have proven that, even with a shock-collar, most vertebrae will make at least a token attempt to flee either of the two countries. Those hummingbirds with ambition can range as far north as Canada. You can make a makeshift hummingbird feeder by hanging a red bottle from a wire. You can make a makeshift hummingbird by taking a wren and whittling away much of its body with a paring knife. On average, hummingbirds weigh about as much as a quarter; in fact, if you see what you think is a hummingbird, but it has a profile like George Washington, chances are that it is a quarter; however, if it turns out to be a hummingbird after all, you’ve got something valuable there and should break out the fly swatter. If you see what you think is a quarter, but it flies, you are probably hallucinating. I would recommend that you stop taking or start taking thorazine. The smallest of the hummingbirds is the Cuban bee hummingbird. It weighs less than a penny and contains a smaller percentage of copper and zinc. The largest species is the giant hummingbird, which can weigh up to twenty grams. This is roughly the mass of two American fifty-cent pieces, three 500-yen coins or two-thirds of a peso. The bee hummingbird is about two inches long, roughly the size of a two-inch length of cord of licorice. The giant hummingbird is around four times as long; in fact, if you shrank a giant hummingbird down to the size of a Cuban bee hummingbird, he would probably become very disoriented. Hummingbirds typically incubate two eggs at a time. This insures that there is always a “good hummingbird” and an “evil hummingbird” in the brood. The evil hummingbird can be distinguished by his goatee. We shouldn’t be too concerned over this because there is only so much a hummingbird can do to you, good or evil. The female sits on her morally ambiguous brood for about a fortnight to 1.28 fortnights. What comes out of these eggs? Inevitably, it is another hummingbird: A creature with a bifurcated tongue, iridescent plumage and an elongated beak. The tongue and beak have evolved to get at nectar deep within a bloom. Its bright colors and shiny feathers were developed so that the bird could enter mambo contests. The metabolic rate of the bird is very high. A hummingbird’s heart can beat at over one thousand times a minute. This is the same rate as some of the newer cut-press machines (hint: The hummingbird is the one with feathers and possibly a profile like George Washington). It can take up to ninety hummingbirds to make a small pie; whereas, it only takes one human pastry chef to do the same thing. However, you can pay hummingbirds in sugar water. Nectar is the primary food of the hummingbird. The bird gets its nectar from flowers, primarily. The hummingbird eats up its body weight every day and may visit hundreds of flowers. Why does the hummingbird need to eat so much? I theorize that it is due to the fact that the bird visits hundreds of flowers every day. Science has been remiss in determining the metabolic rate of a hummingbird that just took it easy somewhere. My guess is that the animal would only need a light snack and a beverage. What sets the hummingbird apart from other birds and even mammals is the fact that it can fly, helicopter-like, stationary or backwards as well as forwards and into a jet turbine. The mechanics of hummingbird flight was determined by training a hummingbird to fly amidst helium-filled soap bubbles. Also determined was the fact that hummingbirds react adversely to being blinded by soap bubbles.